Welcome to the new website of the Gilmours! We hope you find it interesting, learn more about us and more about our Saviour, the Lord Jesus Christ. 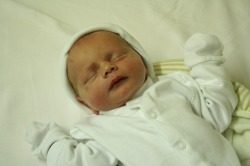 John Muir Gilmour was born on 6th March 2010 at 11.20am. He weighted in at a very average 7lb 6oz, has a good head of hair and a good set of lungs, particularly during a nappy change. Rachel is recovering from a forceps delivery. She was a contraction champion, getting to the delivery stage with nothing but oxygen and a bottle of chardonnay*. But John was in the wrong position and required turning using forceps to be delivered. At this point Rachel received a little more than chardonnay (spinal anaesthetic) and a lot of bruising.